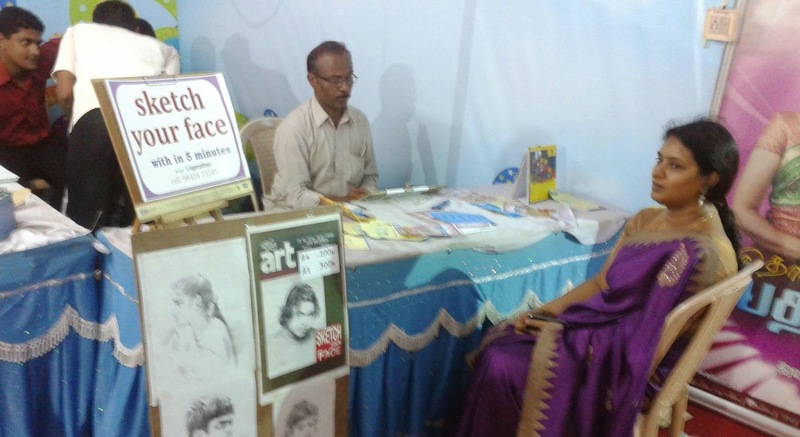 At 36th Chennai Book Fair 2013 I have noted this artist with a charcoal pencil in hand, was engaged in sketching the face of his subject on a white canvas. The stall was crowded with curious spectators. A woman was seated in front of the artist and was enjoying the sketching session. Minutes passed and there appeared on the canvas a surprisingly detailed portrait of the model. The artist was able to produce the portrait with detailed resemblances. He has taken some 20 minutes to sketch the portrait. The artist was able to bring out the essence of the eyes of the subject.